Lotus notes is a collaborative platform for accomplishing various business needs. It is primarily used for an uninterrupted email communication in a secured fashion. The various functionalities include email, contact management, calendar, and instant messaging features. IBM has introduced Lotus Notes as a client application, which works in collaboration with the Lotus Domino server. Both Lotus Notes and Lotus Domino form an effective client-server platform. With the growing need of a highly secured email platform in an organization, Lotus Notes is one of the most widely used email client. Over the years, it has proved to be an effective platform for a successful email communication inside and outside an organization. However, there are other emailing platforms like the one developed by Microsoft as well. They might differ in one or the other aspect; however, the basic functionalities remain the same. Lotus Notes works in synchronization with Lotus Domino server, which is compatible across various kind of server operating system including Windows, UNIX, Linux, etc. Supports data replication for any kinds of data in NSF file format. This allows the user to use Lotus Notes database even in offline mode. Uses highly secure asynchronous encryption technique for authentication. A database can have multiple replicas existing on different servers and clients at the same time on different platforms. Provides great flexibility by allowing you to access data from anywhere and at any time. In addition to the above mentioned features, there are several other features offered by Lotus Notes. Some of them are unique and few of them are common to other email platforms. Lotus Notes uses an On Disk Structure (ODS) format to store the user mailboxes. This ODS format is often referred to as NSF file, which is the database file for Lotus Notes. The file contains user mail data like emails, calendar, address book, etc. In addition to the user mail items, the NSF file also contains some design and other related information about the data. Apart from the NSF database file, which contains the Lotus Notes mails, there is another NSF file by the name names.nsf. This NSF file is an address book file, which contain the list of contacts present on a user’s system. 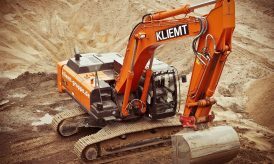 However, working with such a professional tool often stands at risk of getting some problem. Moreover, because of the fact that Lotus Notes is not very common, it requires some advanced technical expertise. Any kind of mishandling can make your Lotus Notes database corrupt. Such database corruption issues are often supported by some kind of error messages. Some of the most common error messages occurring while working with Lotus Notes are mentioned below. “The database cannot be read due to an invalid on disk structure” – This error usually arises while sending mails from Lotus application. “Error compacting Mail *.nsf: Database is corrupt-Cannot allocate space” – This error occurs when you try to open an out of directory file. “Illegal circular use: Audit Trail” – This error occurs when you try to open Lotus Notes document. “Cannot remove Notes document when instantiated by NotesUIDocument’ – You can get this error if you try removing Lotus Notes documents from the database. However, there is more than one reason that can make the database corrupt. In addition, the metadata can also go corrupt. 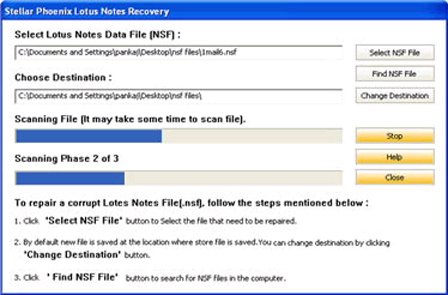 Some of the most common reasons that can make the Lotus Notes database (NSF) file corrupt are mentioned below. In order to overcome the loss from such situation, it is advised to use a professional and reliable tool. 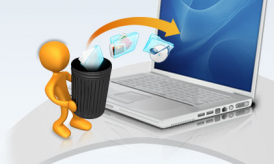 Stellar Phoenix Lotus Notes Recovery is a perfect tool in such situation. It uses an advanced mechanism to scan the corrupt or damaged Notes database file. The tool uses an interactive GUI and is very easy to use. You can perform the NSF file database recovery including user emails and contacts by following the below mentioned steps. 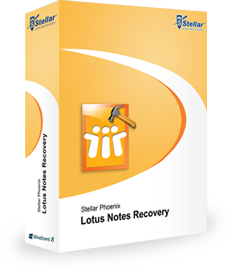 Launch Stellar Phoenix Lotus Notes Recovery software. 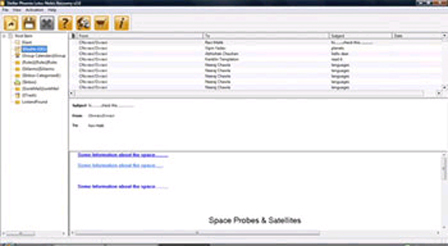 A dialog box is displayed along with the main interface. Select the desired NSF file to be repaired. You can directly browse to the location by clicking ‘Select NSF File’ button. Once selected, the path appears under ‘Select Lotus Notes Data File (NSF). However, in case you do not know the location of the file, you can click the ‘Find NSF File’ option to search for a particular NSF file. This will display a ‘Find NSF File’ dialog box. You can select a particular drive, folder, or a subfolder to search for a particular type of file. The above step will display a list of NSF files in the bottom part of the interface. Click on a particular NSF file to repair it. While repairing you can choose a desired location by clicking on ‘Change Destination’ to save the repaired NSF file. However, the software saves the repaired file in the same folder by default. Click ‘Start’ to initiate the scan process. You can always click the ‘Stop’ button in between to stop the scanning process. Once the scan is complete, you can have a preview of the recovered mail items in the main interface. Once done, the software prompts you telling that the recovery process is complete. 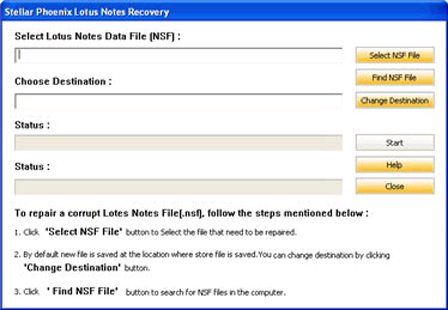 You can navigate to the destination folder to check the recovered Lotus Notes database file. Note: Usually the file which is recovered uses the following format: ‘Recovered_day_month_date_time’. Also it is advisable to every Notes admin to take the backup of Notes NSF file with the help of professional NSF to PST converter tool because sometimes minor corruptions can lead to tremendous data loss and work productivity loss.